​In this article, we short-list the top wedge pillows currently available in the market. Our aim is to provide you with the essential information needed to decide which is the best wedge pillow for your sleep needs. Do you have breathing difficulties when you sleep? Maybe a good pillow is all you need to rectify your night breathing problems. True to their name, wedge pillows are in the shape of a wedge, and they are used to support the legs or the upper body; not just when you are sleeping but also when relaxing in bed or another flat surface. According to Mayo Clinic, wedge pillows are preferred for people with acid reflux (GERD). They are also designed to help people with hernias, back pains, foot problems, and congestion. These pillows, just like any other pillows, are available in different sizes, material, and qualities; this may present a challenge to you when shopping for a wedge pillow for the first time. Don't fret though; we have selected the best pillow for you and gotten the challenge out of your way. We have taken our time to come up with the best of the best in the wedge pillow world. So, feel free to settle for your most preferred one that suits both your style and sleeping patterns. The InteVision Foam Wedge Bed Pillow is one of the bestsellers on Amazon, and maybe for a good reason. It measures 25x24x12 inches and is offered with a highly durable removable cover to enhance cleaning and lengthen the life of the pillow. The pillow was designed in a two-layer design; top memory foam layer and bottom of firm foam. This design lets you experience the soft feel of memory foam while keeping a firm base for maximum support. If you suffer acid reflux/GERD, snoring, have poor blood circulation, allergies or suffer other conditions where breathing may be interrupted, you might want to consider this pillow. The top cover is white and machine-washable. This makes the cover easier to clean and gives your pillow a good look seeing that white can match with any bedroom color. You can support your upper body, and you can also use it to elevate your feet. Weighing only 4.7 pounds, this pillow can be thrown on any part of your bed or moved from place to place. Besides being used in bed, the pillow can be used to make aerobic activities more fun. During shipping, this pillow comes compressed and may take a day or two to regain its original shape; the duration will be determined by your environment. Given its angle of inclination, you can use the pillow when reading or watching TV. 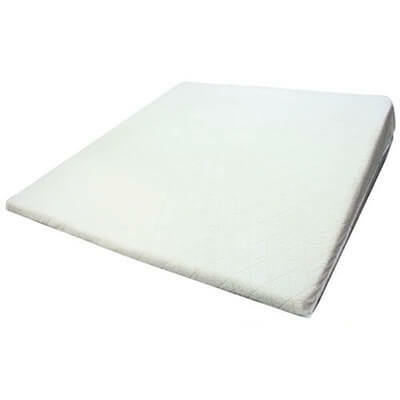 The InteVision Foam Wedge Bed Pillow has garnered more than 3200 reviews on Amazon. Most of the reviews do not fall far from our pros and cons above; they cite the great comfort, the durability and the great effect the pillow has on reducing back pain and acid reflux. A couple of reviewers, however, are against the pillow citing its bad smell the first few days of use due to the quality of the white cover that accompanies it. The main selling point of the Acid Reflux Wedge Pillow from Medslant is its size; it measures 32x30x7 inches, which a size that is believed to be recommended by doctors. This has seen the pillow selling highly. As its name suggests, the pillow was designed to curb acid reflux at night. Acid reflux occurs when acidic content from the stomach moves up the esophagus; by having the upper body support, the airways are opened, and chances of having refluxes are greatly reduced. This pillow is hypoallergenic and thus fit for all. Even better, its top is made of Isofresh memory foam which reduces pressure points keeping your head and neck properly supported for maximum comfort. Its cover is made of Microfiber, a material that is resistant to stains, machine-washable, retains its shape and is soft on your skin. The bottom layer of this pillow is made of tough foam, which not only ensures that the pillow retains its shape but also enhances support. To keep the pillow fresh, it has a special odor management system. For portability, this pillow can be folded in half. Again, side sleepers and back sleepers can use it alike. 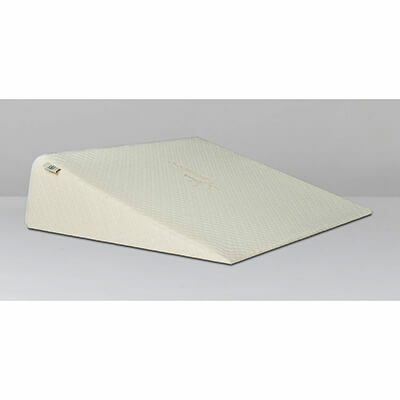 With more than 1500 reviews and relatively high rating, most reviews praise the Acid Reflux Wedge Pillow from Medslant. Most reviewers cite its comfort, its durability, and its good size. However, some reviewers complain of the restrictive return policy. If you need a pillow for your night breathing problems, the Zuma Therapeutic Wedge Pillow from Brentwood was created for that. It is ideal for people with acid reflux, for watching movies on the floor or in bed, and for supporting the back when reading. The slope of the pillow is gradual, giving maximum support to the back and easing respiratory problems. It also reduces neck and shoulder pain. You can choose from three slopes; 7-inch (24x24x7 inches), 10-inch (24x24x10 inches) and 12-inch (24x24x12 inches). The pillow design allows it to elevate legs for better blood circulation and can be used to ease digestion by positioning the torso correctly to enhance positive anti-reflux. The pillow is offered with a stretch knit bamboo cover which is soft, stain resistant and machine washable. The pillow itself comes with a soft top layer and a firm bottom layer for maximum support and comfort. The majority of reviews on Amazon are praises for this pillow. Most reviewers say its size is perfect, ideal for those with breathing and acid reflux problems, and comfortable to sleep on. Some reviewers, however, complain that it is too hard and does not regain its shape fast after unboxing. 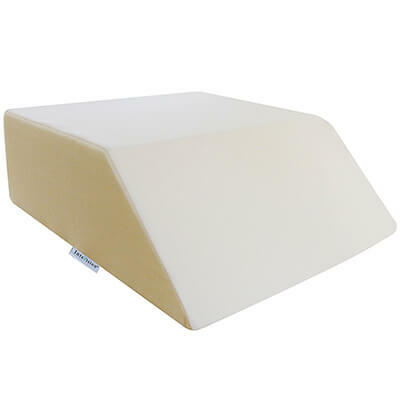 Like other pillows from InteVision, the Ortho Bed Wedge is offered with a two-layer design; the top layer is made of memory foam to deliver a soft feel and comfort while the bottom layer is made of firm foam for support. The pillow was designed to help improve circulation during sleep and also relax the spinal cord and relieve back pain. To this end, it measures 8x21x24 inches; a size that finds a host of applications. This ivory colored pillow is accompanied by a high-quality removable cover, which is stain resistant and machine washable. InteVision has also produced a couple of other covers to meet the demand for covers and bring variety. These new covers are made of Egyptian cotton. Each unit weighs 3.2 pounds making it easy to move around the house. You can use it when reading, watching, relieving back pain or when addressing breathing and blood circulation problems. 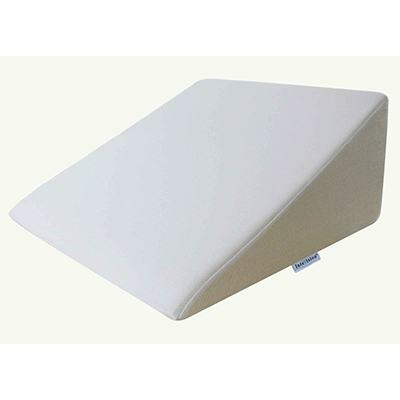 InteVision Ortho Bed Wedge pillow reviews on Amazon are nothing but praises, except a few. With more than 1100 reviews, this pillow has a host of advantages. The strengths cited include durability, great design for comfort and support and great price. Cons cited by reviewers include less durable cover and short for tall people to elevate legs on. There are different wedge pillows, each addressing a different therapeutic issue. If what you need is a wedge pillow to address sinus congestion, heartburn or acid reflux and sleep apnea, you will be better off selecting a standard wedge pillow. However, if you need a wedge pillow for back pain, you should choose a pillow with a steeper incline. Leg elevation wedge pillows are designed with a slight curve and may sometimes have a flat surface at the center. Pregnant women only need a slight inclination to get the blood flowing. Your body size and the size of your bed will determine the size of the pillow you buy. If you have a small bed, it may be aesthetically displeasing to have a large pillow; it may not even fit. When you have a large king size bed mattress and you roll a lot when you sleep, having a large wedge pillow is a good idea. Tall people are better off buying long pillows to fully support their backs or their legs. If you prefer a firmer pillow, the ones made of polyurethane are your best choice. If you prefer softer pillows, memory foam or gel foam is your best bet. Besides these two materials, pillows may be made of inflatable plastic while others may contain polyester fill. Ensure whatever material you choose is hypo-allergenic. The material of pillow cover is important too. Covers should be machine washable, stain resistant and should hold their shape. When you are sleeping, gravity works against you and aggravate a number of issues which otherwise would not be problematic in a normal person. When lying on your back, gravity can collapse your lungs and block upper airways leading to breathing problems. People with sleep apnea have been using wedge pillows to ensure their lungs are open wide enough to improve their breathing and reduce the reliance on CPAP machines, if possible. If you have acid reflux issues and then you lie flat on your bed, acid will move up into your esophagus leading to heartburns, esophagitis or GERD (gastroesophageal reflux disease). If left unattended, GERD can cause esophageal﻿﻿﻿ ulcers. 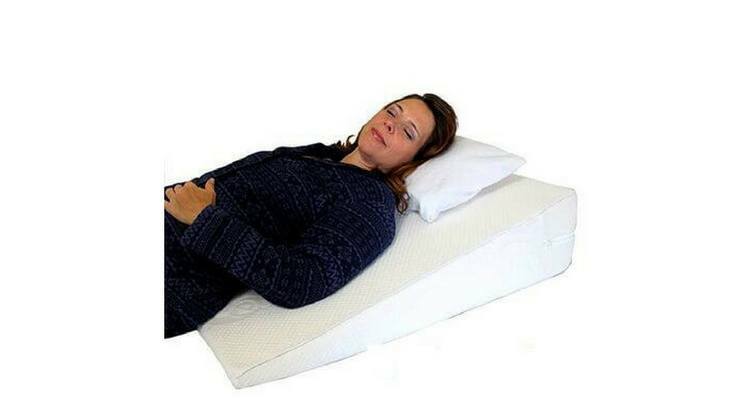 A wedge pillow elevates your head and lets gravity restrict your stomach contents from rising up your esophagus. 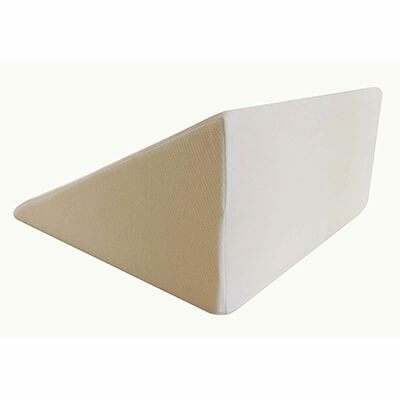 If you suffer from back pains, you might want to try wedge pillows as it offers lumbar and cervical spine support. This is especially important for pregnant women. Those with leg swelling problems can place a wedge pillow below their legs and prevent fluids from pooling in their legs. There are some specially designed pillows for under-legs. Lastly, you can use wedge pillows to reduce nasal blockage and snoring. When your upper body is slightly elevated, sinuses will drain easily giving you enough undisturbed sleep. To end up with the best wedge pillow reviews, we tried a high number of pillows and screened them based on the selection criteria described above. The InteVision Foam Wedge Bed Pillow takes the crown among the four wedge pillows in our list, and for a good reason. The material of the pillow gives it a soft yet firm feel giving not only support but also comfort. The pillow is offered with the right size to accommodate people of different sizes and to nurse different conditions including back pains, sleep apnea, snoring and acid reflux among others. Matter of fact, this pillow has been shown to offer versatility as a therapeutic pillow. Most of the other pillows in the list are either specialized for some conditions or are missing an important feature; they are however great at what they are created to do. The best wedge pillow will depend on you really. We have compiled a list of the best pillows based on our research and some of our personal experiences. While one product may be good for you, it may be inoperable to someone else. Let your needs drive you to choosing the best pillow from our reviews.